The end of apple season is upon us. Our trees are picked clean now that hard freezes are coming our way. Thanks to our trusty root cellars, we've got enough apples stored away to tide us over for the whole winter. For right now, we're busy pressing cider from the assortment of leftovers and dreaming of all the warm apple pies to come later. For your final pick-up, you are receiving varieties renowned for their storage abilities. Here are some tips on how to store your apples. Thank you all for joining us in our fifth year of operation. We strive to promote apple diversity and distribute and [re]popularize unusual or historic varieties. One can tell by the crowds at our booth at the Common Ground Fair, the standing-room-only at John's talks, and the throngs of people tasting their way through the Great Maine Apple Day that the standard selection of grocery store apples just doesn't cut it. By participating in our CSA you help our mission by encouraging the local growers we source from that there is a market for these oddballs. We appreciate your support and hope you join us again next year! The Harpswell Heritage Land Trust in Harpswell on Sunday, Nov. 17th from 2:00-4:30 PM. The talk will be from 2:00-3:00. Apple tasting and apple identification from 3:00-4:30. Those interested in apple ID's, please bring several apples and, if possible, photos of the tree that produced the apples to the event. We've caught word that the New England Historical Society is currently dishing up a collection of historic, regional apple recipes spanning over three centuries -- for free! Just the inspiration we need, as we're now well-stocked with storage apples and the long winter ahead will provide plenty of time to experiment. There are many highly unusual recipes - the American Snowball sounds particularly mouthwatering. We're hoping the more daring among you will attempt some of these recipes as a way to spice up the cold months. If you do, be sure to report back on your findings! Simply sign up to access their site, and download the collection for your e-reader, iphone, or as a PDF. Visit the New England Historical Society here. The apples in your share this week are all keepers, and that means you should try your best not to eat them till the snow is on the ground. True, you may have seen a few of these at farm stands in September and October, but they weren't ripe then and are only now starting to come into their own. If you don't believe us, go ahead and bite into one of those beautiful Black Oxfords when you open the bag this week and then try again in February. We think you'll notice a difference. These are the apples that you'll want to bake into a crisp when a nor'easter is raging outside and the snow it piling up against your door. Or if you can't wait till then, go ahead and bake some Northern Spies into a pie at Thanksgiving - your guests will be delighted. The one apple that won't last as long as the others is Bullock; it only keeps until January so eat them first. You'll find three waxy, yellow varieties in your share this week: Yellow Bellflower, Winter Banana and Tolman Sweet. These apples may share a common color, but they have nothing in common in how they taste. Tolman Sweet is an apple with little to no acidity. You probably won't like it fresh, but it adds a nice flavor to sauce and other baked recipes. Yellow Bellflower has a good balance of sweet and tart and those flavors concentrate nicely when the apple is dried. We won't tell you what Winter Banana tastes like, but it may not have been named only for its color. Bite into one in March and maybe you can convince yourself you are lying on a beach in Hawaii. We often hear that in order to keep the doctor away, all we must do is eat an apple every day. Yet I often wonder; what if I eat 10 apples in a day—as is the case on CSA packing day—does that mean I'm covered for the next ten days? Or what if I eat 10 apples every day for 100 years—does that mean I'll live to be 365,000? Stay away from bland industrial varieties. Golden Delicious is now the top-selling apple in the world, but it is one of the most nutrient-deficient varieties available (2nd only to Ginger Gold). Go for the most colorful. You get the highest phytonutrient content from the most colorful fruit of a given variety. In other words, the deeper in color, the more phytonutrient-dense. These are the apples that grew at the top of the tree or on the outer limbs, where they were exposed to direct sunlight. To ward off ultraviolet rays, they had to produce an extra supply of pigmented phytonutrients. The apples retain this extra supply even when they are stored in the dark for months. (Phytonutrients strengthen the body's protection against chronic inflammation, high cholesterol, cancer, and cardiovascular disease.) Apples at the top of the tree contain twice as many antioxidants as apples that are hidden among the leaves. Even on the same apple, a bite from the sunny side can give you twice as many nutrients as a bite from the pale side! Eat the skins. An unpeeled apple can give you 50% more phytonutrients than a peeled apple. In an animal experiment, extracts from peeled apples inhibited the growth of human cancer cells by 14%, but extracts from unpeeled apples blocked the growth by 45%. Choose cloudy apple cider/juice. Clear apple juice—think Minute Maid or Mott's—can contain as little as 6% of the nutrients in the original apple (the other 94% is left behind at the processing plant). You will get as much as four times more nutrients if you drink unfiltered (“cloudy”) juice/cider. Some juice makers are now labeling their products as “unfiltered” even though a significant amount of the phytonutrients and pectin has been removed. You can spot the impostors by holding a bottle of cider up to the light—you should not be able to see through it, and there should be a layer of sediment at the bottom of the bottle. Drink to your health! Robinson, Jo. Eating on the Wild Side: The Missing Link to Optimum Health. New York: Little, Brown and, 2013. I made an apple crisp of sorts with the Maiden'sBlush apples in my own "experimental kitchen". Create a nut crust (5 tbsp butter, 1 1/3 cup crushed nuts of your choice, 2/3 cup milled flaxseed). You push the crust into the bottom of a baking dish, put sliced apples (as I said, I used Maiden's Blush), raisins, and date pieces on top (I kept the peels on my apples and spiced the whole mix with pumpkin pie spice and extra cinnamon). 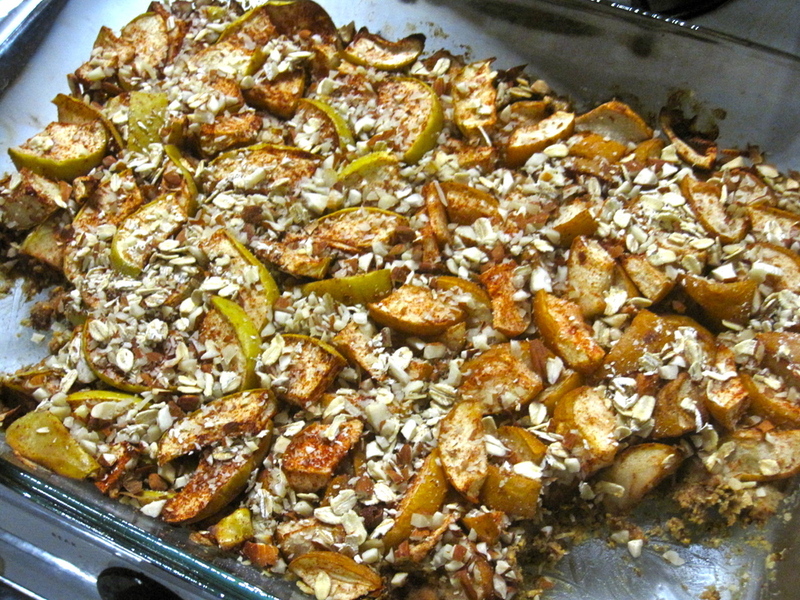 Then top the fruit with a few crushed walnuts and a little oats, then bake for 30 min at 375. It's amazing as is, or topped with fresh cream. I even ate some cold with greek yogurt this morning and it was a heavenly breakfast. In this photo, we'd used two of this week's storage varieties, which felt somewhat wrong, though it was certainly delicious. John Paul enjoyed the texture of the Winter Banana apples (which you can tell by the still-yellow skins) while Emily preferred the Bullock side (R) for its tartness. This will sink in the middle a bit, but is super moist and cinnamon-y. Aaaand that's it for the season. Savor your apples, make them last; we've got a long way to go before we see 'em again next year. As always, we love feedback. Send love letters, that one recipe you use to wow everyone you know, and general inquiries to csa.outonalimb@gmail.com.